Check out the video below to see an overview of the new features of PolyNome 2.2.8. They’re also listed below the video. New context menus – tap and hold on, above, or below the notes on Met1 and Met2 to see context menus for shuffling rhythms and displacing stickings. 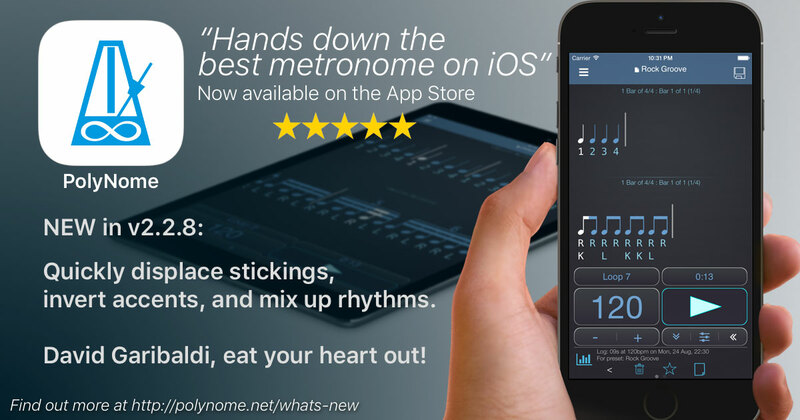 If you have a couple of minutes to spare and enjoy using PolyNome I’d really appreciate you leaving a positive review. Reviews are reset with each new update, but it’s quick to re-post once you’ve left an initial review.